A Hyperlink is a text, which references to a particular place. It is usually highlighted and underlined in a way that it can be distinguished visually from normal text. You often deal with hyperlinks when you view web pages. But you can also find them in Excel and they have a similar purpose to those found on web pages. To insert a new hyperlink, go to INSERT >> Links >> Hyperlink. After you click the button, note that on the left side there are four different buttons, which you can use to insert hyperlinks. You can create the hyperlink that points to a website (which will open in a browser) or a file (which will be opened by the default program). The text of the hyperlink will be the name of the file or the page address you entered. To change this, click the text box, which is located next to the Text to display. Click the OK button to insert the hyperlink. When you click the link, it will be opened by the default browser or default application, depending on whether you entered a website address or a link to a file. By default, Excel converts text to link when you enter the address of a website directly into a cell or the formula bar (for example „http://google.com” or „www.google.com”). If you want to enter a web address as a text, use the Ctrl + Z keyboard shortcut, just after you confirm the entered value. The second button is the button called Place in This Document. It is used to insert a reference to cells which are located in the worksheet. If you have multiple worksheets in the workbook and you want to place the hyperlink that points to a different worksheet, you can do it by selecting it from the list. At this point, Excel allows you to create a hyperlink to a document. The document is automatically created after you click the OK button. 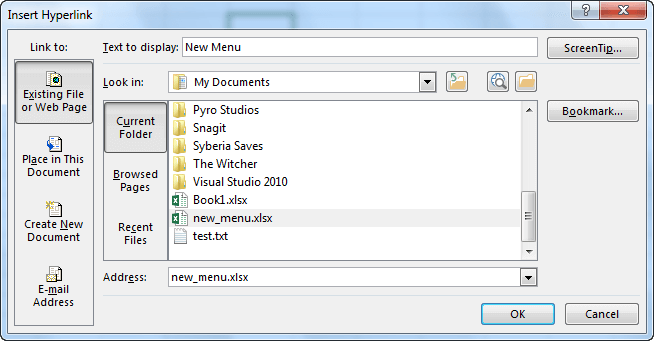 Here, you can choose whether a new file should be opened for editing or saved as a blank document. When you click this link you can send an e-mail. If your mail client is not configured then a message will inform you that you cannot perform this operation.